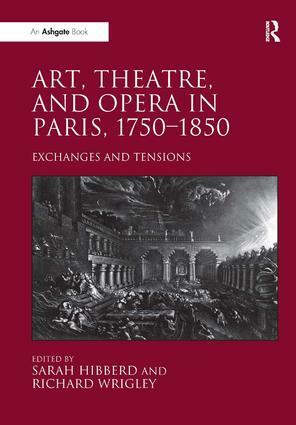 Art, Theatre, and Opera in Paris, 1750-1850: Exchanges and Tensions maps some of the many complex and vivid connections between art, theatre, and opera in a period of dramatic and challenging historical change, thereby deepening an understanding of familiar (and less familiar) artworks, practices, and critical strategies in the eighteenth and nineteenth centuries. Throughout this period, new types of subject matter were shared, fostering both creative connections and reflection on matters of decorum, legibility, pictorial, and dramatic structure. Correspondances were at work on several levels: conception, design, and critical judgement. In a time of vigorous social, political, and cultural contestation, the status and role of the arts and their interrelation came to be a matter of passionate public scrutiny. Scholars from art history, French theatre studies, and musicology trace some of those connections and clashes, making visible the intimately interwoven and entangled world of the arts. Protagonists include Diderot, Sedaine, Jacques-Louis David, Ignace-Eugène-Marie Degotti, Marie Malibran, Paul Delaroche, Casimir Delavigne, Marie Dorval, the 'Bleeding Nun' from Lewis's The Monk, the Comédie-Française and Etienne-Jean Delécluze. Contents: Introduction, Sarah Hibberd and Richard Wrigley; Hearing through the eye in eighteenth-century French Opera, David Charlton; Nihil per saltum: chiaroscuro in eighteenth-century lyric theatre, Mark Darlow; Musical mutualism: David, Degotti and operatic painting, Mark Ledbury; Music, theatre, and the Gothic imaginary: visualising the ’Bleeding Nun’, Thomas Grey; Belshazzar’s Feast and the operatic imagination, Sarah Hibberd; Romantic painters as costumiers: the stage as pictorial battlefield, Olivia Voisin; Delaroche off stage, Stephen Bann; Performers and spectators: viewing Delaroche, Patricia Smyth; Delaroche and the drama of history: gesture and impassivity from The Children of Edward IV to Marie-Antoinette at the Tribunal, Beth S. Wright; Playing with excess: Maria Malibran as Clari at the ThéÃ¢tre Italien, Céline Frigau Manning; All mixed up: Etienne-Jean Delécluze and the théÃ¢tral in art and criticism, Richard Wrigley; Bibliography; Index. Sarah Hibberd is Associate Professor in the Department of Music at the University of Nottingham, UK. Richard Wrigley is Professor of Art History at the University of Nottingham, UK.